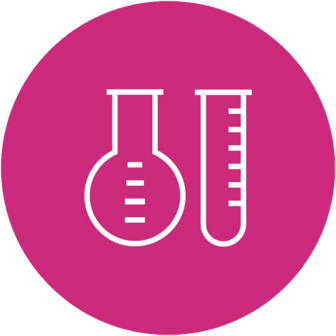 When creating a novel therapeutic, either a small molecule or biotech, processes are typically developed at laboratory scale. These laboratory scale production processes may be sufficient for early efficacy and toxicity studies in small animals and for related pre-clinical work. In order to ensure that the results from these early studies can reliably be used as predictive markers for later, larger scale productions, it is beneficial to manufacture these batches as close to GMP as possible. For this HALIX can work with you. Starting with small scale production in our development laboratories, we can proceed all the way through your clinical phases up to commercial scale production. HALIX can produce early phase drug substance and drug product in our development laboratories. Our customizable and highly flexible way of working ensures that we can transfer in your processes with a minimum of effort. Our quality driven organization ensures that the small scale batches are as close as possible to full scale GMP Manufacturing. In addition we can offer comprehensive QC testing to complete your GMP requirements. We can support your lyophilization cycle development with our small scale lyophilizer. In a later phase, all our small scale lyophilization processes are easily transferable to the industrial sized lyophilizer in our main GMP facility. To find out how we can support your needs in GMP small scale production, contact our dedicated staff. I consent to the use of my personal data for the purpose of responding to my message. © Copyright 2018 HALIX B.V., all rights reserved. Design by AJB. Functional: to accept functional cookies which are necessary to let the HALIX website (halix.nl) function. Analytics: to accept functional cookies which are necessary to let the HALIX website (halix.nl) function and analytical cookies which we use to measure and analyse visits to our website.